Over the years we have created a lot of flashcards. In the early 90's most of our sales came from local trade shows. We used to put flashcards on floppy diskettes and sell them individually. This only worked in person and we couldn't seem to find a cost effective way to sell them otherwise. CDROMS solved some of this, but they were still too expensive to manufacture. 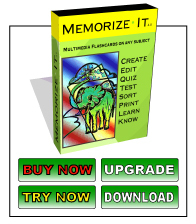 In the late 90's we swtiched completely to online sales of Memorize-It and I always dreamed of selling the cards again. This time the barrier were credit card fees. It seemed that the minimum you could charge for something was around $10. With the advent of Apple iTunes, it seems the credit card processors have changed their tune. Once it became apparent that the tide had changed I created a new site to sell the flashcards for as inexpensively as I could. In most cases they are $1.99, but I have gone as low as $.99 cents. Would you like to make money selling flashcards? I'm willing to give you most of the proceeds. All you have to have is a bunch of flashcards that people will want to buy. Upload them to our flashcard website and direct people to buy them there. For each deck sold, I will take 15% plus $0.35. The $0.35 is the minimum fee I'm charged by the credit card company. It is just a way for them to keep the minimum sales item at $0.99. I'm just passing that cost on. You would make nearly 85% of the profit. These numbers are subject to change when my credit card processor changes their rates, but I want you to make money.